In a game that pitted the Staats brothers against each other for the first time in their careers – Austin for San Diego and Randy for Georgia – the Swarm came out on top 17-10. Georgia got things started early and never looked back as this game was never really in doubt after the first few minutes. While Georgia’s offense was the driving force behind their performance, it was the defense that impressed the most, especially in transition. They were simply “swarming” all over the floor. Their aggressiveness really limited the amount of opportunities San Diego was able to get throughout the game, and especially in the first half. The opposite could be said for San Diego as the Seals’ defense didn’t look like their normal selves, allowing Georgia open looks in front of the cage all game long. “Right from the opening whistle they played with a purpose and put us on our heels. They out-competed us and executed all night,” said Seals’ general manager and head coach Patrick Merrill in a press release. Bryan Cole and Randy Staats got the scoring started to give Georgia an early 2-0 lead before Dan Dawson got San Diego their first of the game. Georgia was able to go on a two-goal run and San Diego got one more before the quarter ended with Georgia holding a 4-2 lead heading into the second. In the first quarter San Diego transition player and frontrunner for rookie of the year Austin Staats took a hit into the boards. He was down for a minute and had to be helped off the floor. He did not play the rest of the first quarter but did return in the second. While the momentum was still leaning in Georgia’s favour, things were a little more back-and-forth in the second as San Diego started to finally get their offense in rhythm. Georgia started the scoring early on in the second and San Diego answered less than a minute later. Georgia then answered with a two straight. That pattern continued for the majority of the quarter as Georgia was able to take a 10-6 lead heading into the half. It was a slower third quarter as far as scoring goes. Both defenses stepped up and played very well for the majority of the quarter. While San Diego cut the Georgia lead to 10-7 early in the second Georgia answered with two goals to take a five-point lead midway through the third. Dan Dawson was able to get the Seals’ offense going again with a goal late in the third. With Georgia holding a four point 12-8 lead heading into the fourth things did start to get chippier. A five-goal run to start the fourth quarter for the Swarm effectively ended this one. During that run Holden Cattoni caught fire, scoring a natural hat trick – three in a row, including one shorthanded, one even strength and one on the power play. The Seals were able to find the back of the net twice late in the game but by then things had already been decided and both teams had their backup goaltenders in between the pipes. That run helped Georgia secure the 17-10 win and put the Swarm in first place in the East, with a little help from Toronto as they beat Buffalo. Georgia was led by Holden Cattoni who tallied eight points (3G/5A) and Shayne Jackson with seven points (3G/4A). Lyle Thompson also had six points (4G/2A) while Randy Staats had seven points (1G/6A). On the defensive end Alex Crepinsek was a difference maker, scooping up six loose balls and causing one turnover. 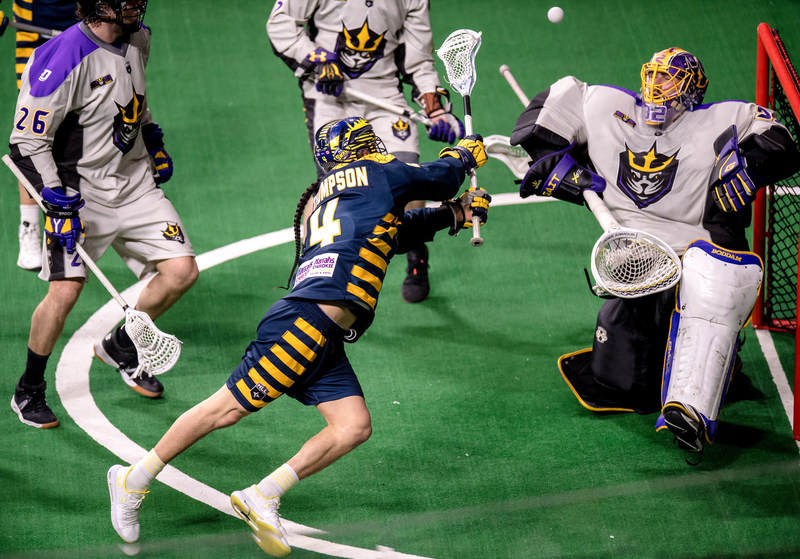 “The fact that they can’t key in on Lyle (Thompson) or Randy, myself or Jackson is huge,” said Cattoni. For San Diego, they were led by Dan Dawson who tallied six points (3G/3A) for the Seals. Garrett Billings also had four assists on the night as well. Garrett Epple caused one turnover and scooped up six loose balls on the defensive end. Mike Poulin made 38 saves off 47 shots on goal for Georgia while Kevin Orleman also saw time, making just one save in 2:54 of action. Frank Scigliano made 35 saves off 49 shots on goal for San Diego, while Tyler Carlson also got some time, making seven saves off 10 shots on goal. San Diego is back in action on Saturday night as they take on New England in their second game of this back-to-back weekend. Georgia will be on the road at Calgary next weekend.